Fighting robots will top a bunch of politicos in a battle of newcomers at the box office this coming weekend. Real Steel is a film that will appeal to families and teens—a deadly combination. If both groups come out in droves for this Transformers-meets-Rocky project, then the opening could exceed even Disney's wildest expectations. Star Hugh Jackman may be hit (X-Men Origins: Wolverine) and miss (Australia) at the box office, but Real Steel's high-concept story is perfect for mainstream digestion. There's no stopping this one. As of 4 p.m. PT, Fandango is reporting that Real Steel accounts for a modest 6% of daily sales. The Twilight Saga: Breaking Dawn - Part I leads with 35%. Real Steel is clobbering The Sorcerer's Apprentice—another Disney release aimed at similar demographics—on Facebook and Twitter. Subscribe to Boxoffice Pro for complete Facebook and Twitter tracking. Look for Real Steel to grab $24.5 million from around 3,300 locations during its debut frame. When it comes to political flicks, The Ides of March is as cynical and uncompromising as they come. For some moviegoers the film will serve as a much-needed look at how vile and corrupt the American political machine is, while others will avoid it all together for essentially the same reason. The current bickering over the Republican presidential nomination could also cause some political fatigue among viewers who would normally have lined up for Ides. 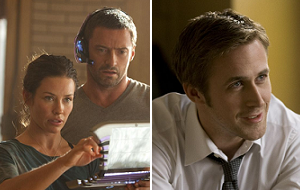 One big thing that Ides has going for it is the current hunger for serious-minded films aimed at adults. Midnight in Paris, The Help and Moneyball are three examples of recent hits aimed at older moviegoers. George Clooney's latest directorial effort will be in good shape if it can tap into that hunger. Activity on Facebook and Twitter for The Ides of March leaves something to be desired. The Sony release doesn't hold up well when compared to The American and Wall Street: Money Never Sleeps. Fandango reports that Ides has yet to crack the top 5 sellers list, which isn't necessarily a bad sign for a film that's bound to skew older. Expect The Ides of March to take in $12 million from around 2,000 locations during its opening weekend.